Here is a perfect pie to make for the holiday dinner. The butter and rum add a luscious quality to the pie. It tastes savory, yet at the same time delicate and not overly sweet. And the aroma of the spices permeates your senses, creating a sense of warmth and comfort for the home. 1. Peel and slice apples into 1/4 inch thick, then cut the slices to about 1″ pieces. 2. In a large bowl, combine apples slices, dried cranberries, brown sugar, corn starch, cinnamon, nutmeg and white pepper. Gently stir until well mixed. Set aside. 3. Melt butter and rum together in a small pot over medium high heat. Bring to a boil for about 30 seconds. 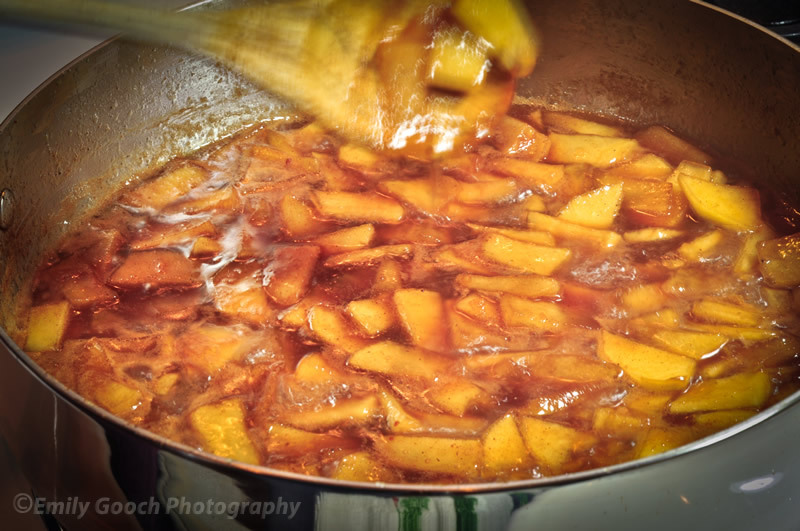 Pour hot butter rum mixture into the pie filling mixture and stir gently — until all apple slices are well coated. 4. Pour filling mixture into a prepared pie crust. 5. Sprinkle streusel crumb evenly over the pie. In a mixing bowl, combine butter, flour and sugar. Add rum and toss with a wooden spoon to make crumbs. Take a hand full of the crumb mixture and squeeze gently to make larger clump. Break the clump of streusel over the pie filling. Repeat using all the streusel. Do not press the streusel into the filling. Bake in a 350 degrees oven for about 30 minutes. Check to make sure the streusel crumb isn’t too brown. Cover pie with a piece of foil and bake for another 15 minutes. Take off the foil and bake for an additional 10 minutes. By now you should see thick hot pie juice bubbles out of the crumb topping. Take out the pie and let cool before taking it out of the spring-form pan. In a large saute pan over medium high heat, melt butter. Add apples and saute for a few minutes. Make sure the heat isn’t too hot or the butter will burn. Pour in apple cider and add sugars, nutmeg, and cinnamon. Stir apple mixture and when it boils, turn the heat down to medium. Cook apple mixture for 20 minutes and add the rum. Make sure to stir occasionally. Continue to cook for an additional 15 minutes. The apple slices should be soft and almost translucent. 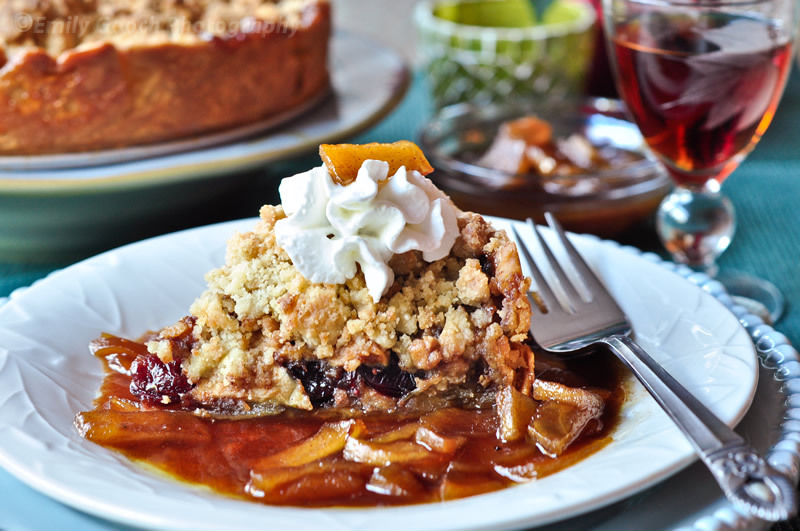 Place a slice of pie on a plate and ladle a couple of tablespoons of the Apple & Butter Rum Sauce around the pie and top with whipped cream if desired. Enjoy!